How can a cook or Northeastern student in Pune be culpable for Bodo violence in Assam? Leave a Comment on How can a cook or Northeastern student in Pune be culpable for Bodo violence in Assam? The Azad Maidan riot was based on false propaganda and sends out the wrong signals. THERE’S A primary Gandhian rule Baba Ramdev does not seem to have heard of: to shame an adversary, one must be of high moral character oneself, or at least, be a self-critical aspirant. But the beauty of a democracy is that despite their deficiencies, even tin men and gimcrack babas have an enshrined right to protest. They can protest corruption even if they are very corrupt themselves; they can shift positions hourly; have no solutions; and generally whip up a storm on infantile formulations. Such noise may yield nothing (except eventually hollow out the idea of protest) but the right cannot be denied. The Anna Hazare and Baba Ramdev movements demand sustained dissection on many counts. What about them makes the nature of the messenger as important as the message? But as their protests remain irreproachably peaceful, another protest this week demands a different dissection. The violent rioting by some Muslim protesters at Azad Maidan in Mumbai last weekend — gathered to condemn the Bodo-Muslim clashes in Assam and the persecution of Rohingya Muslims in Myanmar — was indefensible. Two dead, vehicles torched, media vans attacked and over 50 people injured, many of them policemen and women. From that senseless conflagration, flew other embers: several Northeastern citizens attacked in Pune and elsewhere in the country. As isolated incidents of arson, this would have been condemnable enough. But there are four other aspects of the Azad Maidan riot that are extremely disturbing. First, the rage that boiled over at the rally was stoked on false propaganda. Gruesome images of dead bodies massed in heaps had been cynically circulated on the Net with calls to Muslims to “awaken and fight”. It is Faraz Ahmed, an intrepid Pakistani Muslim, blogging for The Express Tribune, who first established the lies. Tracking the original images, he showed how tear-gassed protesters in Bangkok (still alive), earthquake victims in China being tended to by Tibetan monks, and other victims of Thailand police action were being passed off as the butchering of Rohingya Muslims by the Buddhist Myanmarese. (According to media reports, a rioter in Pune confessed that he and his cohorts had been attacking “Chinis” — people with Mongoloid features — because they were angry with images showing what “Chinis” were doing to Muslims. Confronted with the untruth of the images, he said he regretted his action.) Unfortunately, though Faraz Ahmed’s intervention is the only wise tactic, this incident is bound to add fresh heat to the Internet censorship debate. But the falsity of the propaganda — and the ease of anonymous transmission on the Net — is just one end of the thorn. What if the images were true? Can the ideas of ‘provocation’ and ‘grievance’ ever be legitimately twinned with random retaliatory violence? Rohingya Muslims are indeed being persecuted. And Muslims are one half of the dual tragedy playing out in Assam. Does that justify other Muslims making ‘common cause’ and retaliating against unrelated, geographically distant people elsewhere in the country? Should anger be transported like this? How can a Northeastern student or cook in Pune be culpable for Bodo violence in Kokrajhar? Did it make sense that the Muslims of Gujarat were made to pay for the crime of a few Muslims in Godhra? The other Indian failing that reinforced this week is the racist idea of a ubiquitous “Northeasterner” or “Chini”. For the rioters in Pune, a Bodo tribal, a Meitei Manipuri and a Nepalese from Darjeeling were clearly indistinguishable and interchangeable: like peas in a bad pod. Unfortunately, this is not a stray blindness: it is almost a national trait. Finally, the worst spin-off of the Azad Maidan riot is that what was until now being framed as an ethnic conflict has now effectively been communalised. The Internet is abuzz with the Hindu Right asking its cadres to “arise and awaken”. Gratefully, in a timely salve, several Muslim leaders, including Haroon Mozawala of the All India Muslim Personal Law Board, have stepped in to unqualifiedly condemn the rioting. “Our heads are hanging in shame,” Mozawala told the PTI, and urged those responsible to surrender to the police. Other Muslims online have also criticised the community for protesting only as co-religionists; of nursing an idea of collective victimhood; of believing they are the only ones who ever get a “raw deal”. Nothing can be a more healing counter-current than such voices from within. And, in the weeks to come, may the noise of India’s current street theatre, at least occasionally, be drowned out by these. 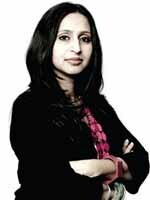 Shoma Chaudhury is Managing Editor, Tehelka. Previous Entry THE MAKING OF A CHAMPION !